This is my third time watching this movie, and it doesn’t get any easier. The story is incredibly heart-breaking, constantly wagging some slim thread of hope in front of you and yanking it away. There are films with more and greater hardship, but few directors have the ability to make it so powerfully affecting like Mizoguchi. The way he draws out the ending of this film, letting each little moment sink in, building tension by delaying those emotional beats we know are coming… it’s masterful. Immaculate framing and composition, and some of the most graceful camera movement you’ll ever see. Some gloriously beautiful images here… without giving anything away, there’s a pair of scenes by a particular body of water that are quietly breathtaking. And an earlier scene involving water — the initial abduction — is brilliantly shot as well. 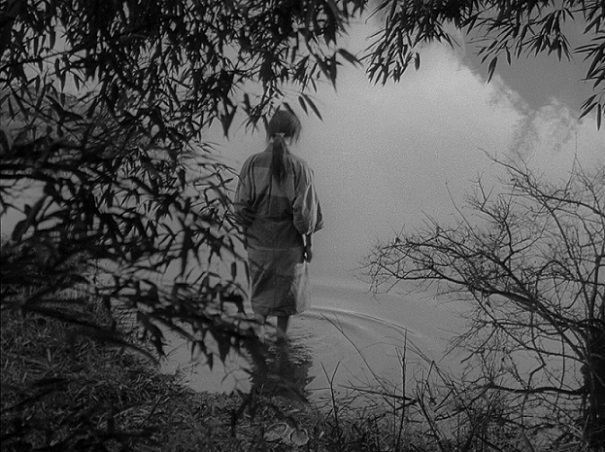 Mizoguchi moves the camera when there’s motion in the story and keeps it still for moments of reflection and revelation. Also some terrific cuts from present to past in the flashbacks. This entry was posted on March 6, 2013 at 6:33 pm	and is filed under Movie Reviews. You can follow any responses to this entry through the RSS 2.0 feed. You can leave a response, or trackback from your own site. Just happened to see this myself a few days ago. Beautiful, amazing, and very wrenching. A clinic in filmmaking but as you say also almost hard to take. Definitely not a movie for a casual summer afternoon viewing. That last scene is a killer. Thanks for commenting! I took a quick peek at your blog, looks good! Thanks, regular reader, always mean to comment more but you know how that goes! Keep up the good work.